What does it mean when the owners of big companies say they will move because our corporate tax rates are “too high” and not “competitive”? Just who are we “competing” with, and for what? Extortion is the practice of obtaining something of value through fear, using force, threats or coercion. Companies say that our corporate tax rates are “too high” and they will leave the United States if their taxes are not reduced. This is a threat. This is extortion. Companies say they will move from one state to another if their taxes are not reduced, taking jobs with them. This is a threat. This is extortion. Companies say they will move from one city to another if their taxes are not reduced. This is a threat. This is extortion. What is the result of giving in to these threats? If we lower taxes we collect less tax revenue. If we collect less tax revenue we have to either raise taxes elsewhere or cut what we can spend on fixing roads, water systems, schools and other vital infrastructure. 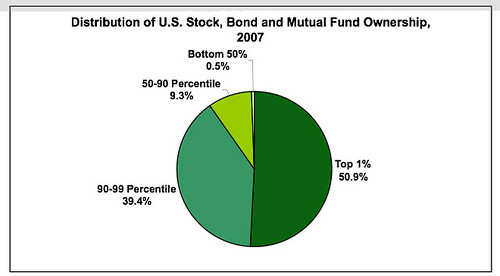 As of 2007, the top 1 percent owned 50.9 percent of all stocks, bonds, and mutual fund assets. The top 10 percent owned 90.3 percent. Things have only concentrated upward since then. This is who we are talking about when we talk about corporate tax rates. Tax cuts for the rich and corporations are taking their toll. In 1952 corporate taxes accounted for one-third of all federal tax revenue, that has fallen to 9 percent. The difference is made up from other taxes (on you and me) and borrowing. In other words, the wealthy owners of corporate stock – the top 10 percent – paid one-third of all federal taxes just through corporate taxes. Now it’s 9 percent. This is aside from the top income tax rate also falling from 90 percent to 39.6 percent in the same period. Guess who made up the difference, whether through increased taxes, borrowing or cutbacks in schools, maintaining the infrastructure and all the other things government does to make our lives better? It is not a coincidence that at the same time the 1 percent’s share of wealth and income has increased dramatically. It is also not a coincidence that we have been deferring and deferring maintaining and modernizing our infrastructure, and other public assets. It is not a coincidence that our education system falls further and further behind. It is not a coincidence that we have a 1950s rail system while much of the rest of the world has moved to high-speed rail. Because we have the highest corporate tax rate in the developed world, American companies have an incentive to relocate their headquarters overseas to lower their tax bill. The site is full of the kind of wording that is developed using polls and focus groups. When you scroll down past the talk of how our tax rates are “too high” and “not competitive,” the page starts to talk about “inversions” which is companies leaving the country to dodge their taxes. Recognize it for what it is. This is extortion. In 1986, the top corporate tax rate was 46 percent. (That was reduced from 48 percent in 1978, which was reduced from 52.8 percent in 1969.) Corporations complained that this was too high, and not “competitive” with rates around the world. The corporations played an extortion game, saying lower our taxes or we’ll move out of the U.S. This is what they mean when they say the rates are not “competitive.” They mean other countries are offering us a better tax deal. The U.S. gave in, “reformed” the tax rate and lowered corporate taxes to 35 percent. Then the corporations went from country to country, playing the same extortion game. One by one these countries gave in to the extortion and lowered tax rates. Now they’re back, saying that our tax rates are not “competitive” and threatening to leave the country if we don’t lower their taxes. This is extortion. Giving in to extortion and cutting taxes again and again is a race to the bottom. There is no net gain in jobs when a company decides to locate in one city or state over another. There is only loss of tax revenue to the government. This means the roads, schools, courts and the rest suffer. Then the local economy suffers because it is no longer “competitive” – and the corporations pack up and leave. Why Do We Even Have Corporations? We have to stop giving in to extortion. We have to ask why did We the People pass the laws that allow corporations to exist at all in the first place? We have to remember that the idea was to promote the ability of investors to aggregate funds to accomplish things to benefit us. The deal was we would let investors have all kinds of legal privileges and in exchange we would get good and well-made products for our benefit, good customer support to benefit us, good wages and benefits for our benefit, safe and healthy workplaces for our benefit and the companies would pay a share of their gains in taxes so we could keep the cycle of prosperity going for our benefit. Why else would We the People have gone into this with these corporations in the first place, except for our benefit? Think about that. In July’s post, A Simplified Way To Tax Multinational Corporations I wrote about an idea to tax companies based on their percentage of sales in the U.S. If 50 percent of their sales occur in the U.S., then apply taxes to 50 percent of their profits. This keeps companies from using schemes to make it look as if profits are made elsewhere, thereby removing the reason to move a company out of the country.